This is a long overdue post, but lately I was very busy with work, also had a 2-day Paris trip. It is always inspiring to see the Christmas spirit in Paris. I was actually blown away by the patisserie arts- it is not my first time there, but I have seen new places that are filled with mouthwatering goodies (even if I don’t eat and crave for sweet stuff a lot). During this time, I was thinking and doing my research on a classic Christmas recipe. 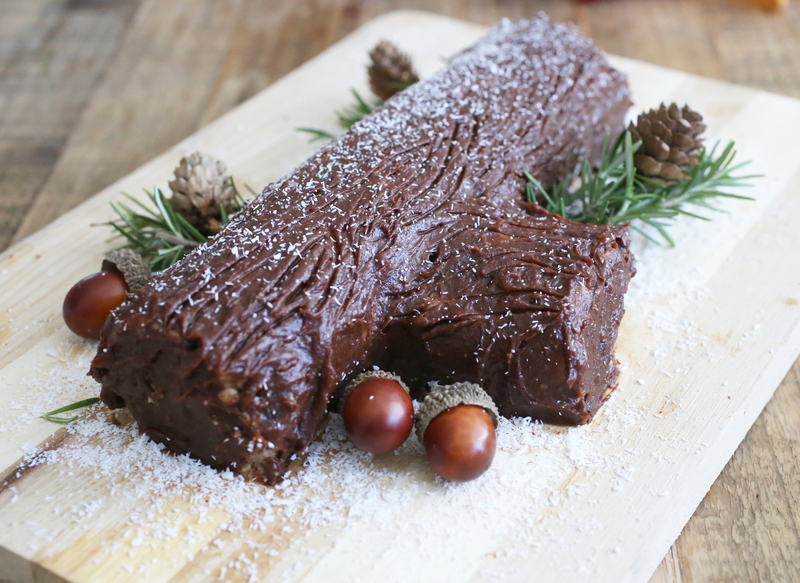 So I came up with Bûche de Noël or Yule Log if you prefer, which is a Christmas dessert that is originally French. Of course I could not use the original recipe, which is full of refined sugar, flour and other ingredients I don’t even have in my kitchen. I tried to find a raw version of this, and I found one recipe here. This original recipe uses avocados, but I didn’t have avocados in hand, so I changed the recipe: I used more dates and coconut oil for the chocolate filling. It became a little bit heavier, so I will definitely try it with avocados next time, I assume it will be fluffier. Also I didn’t use matcha for the crust, but jasmine tea. Process the dried coconut, the oats and the buckwheat – all separately – in a blender until finely chopped. Melt the cacao butter in a bain-marie. In a large bowl, mix together all the ingredients until the composition starts to hold together. Transfer the biscuit composition on a parchment paper, roll it to get a homogenous crust. Set aside while you are preparing the fillings. Combine all the ingredients: avocado’s, dates, cacao powder, agave or honey– in a food processor until everything is smooth. Process the hazelnuts in a mixer to get a finely flour. Combine the hazelnut flour with 4-5 tablespoons of chocolate filling and other ingredients. Spread the Nutella mixture on the biscuit crust cake, completely covering it. Roll up the cake with parchment paper from short side. Cover the roulade with the rest of the chocolate filling to get a Bûche look. You can use a fork to give the wooden texture. 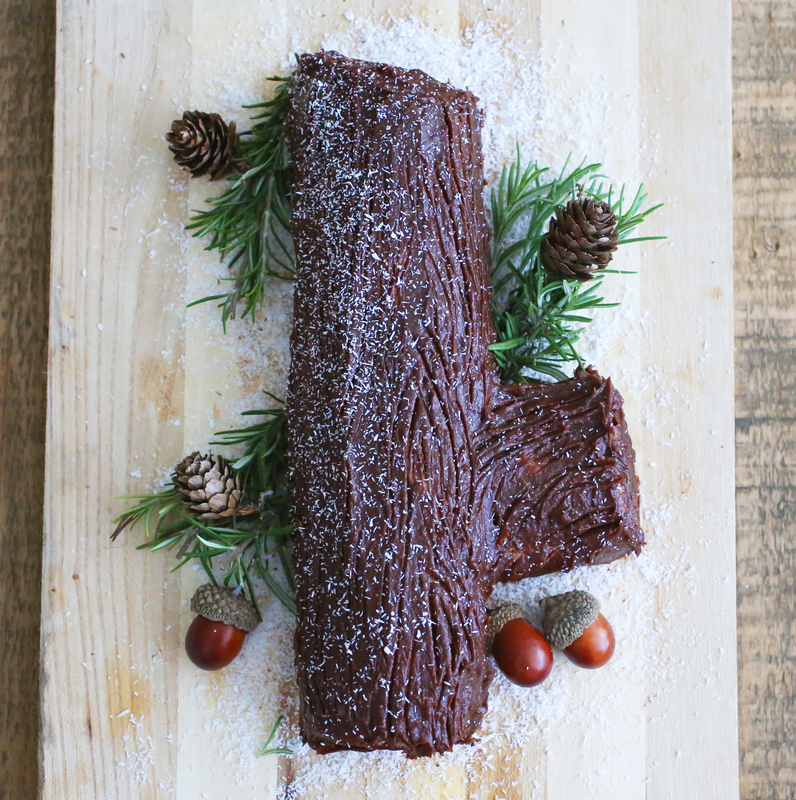 Decorate with acorns, rosemary, and shredded coconut. 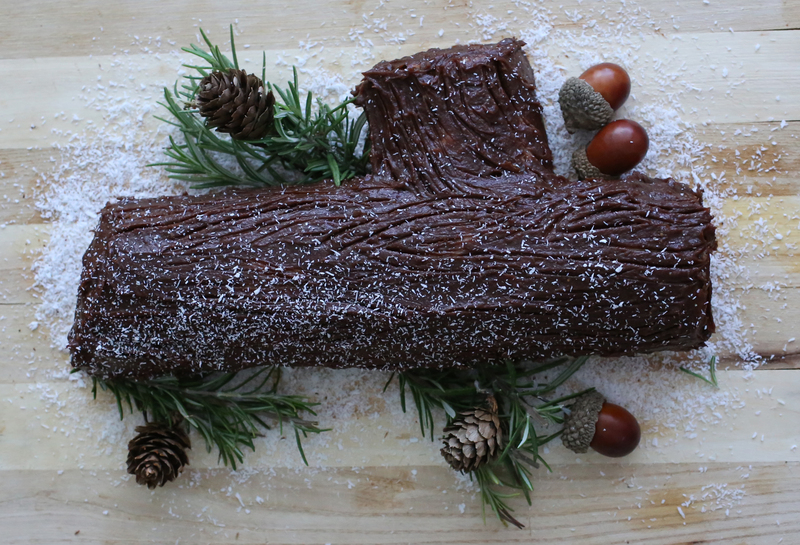 Cisem, this is the most beautiful raw bûche I have even seen! Wish you a warm Christmas!